Early duties included service in the Signal Corps, and after instruction from the Wright Brothers, he himself began the training of pilots. 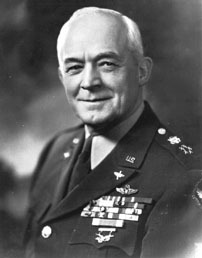 He rose to Assistant Director of the US Army Air Corps in 1935, becoming Director in 1938 and holding that office throughout World War II. In 1940, knowing war was coming, he asked President Franklin D. Roosevelt for 100,000 planes over coming years -- far more than his underlings had thought necessary, but a number much closer to reality. A series of heart attacks limited his effectiveness in later years. Even so, Roosevelt in 1944 appointed him a five star general -- a position held also by Omar Bradley, Dwight D. Eisenhower, Douglas MacArthur, and George C. Marshall. Arnold was also instrumental in creation of the Civil Air Patrol in 1941. He retired from active duty in 1946 and after writing a memoir, Global Mission, died in 1950 due to his heart condition.